Many people living on the go are looking for the best YouTube videos Downloadhelpers for their Android devices every day. Video-sharing websites like YouTube, Vimeo, Netflix, etc. have attracted flocks of viewers since we stepped into the Internet age. With more and more videos uploaded, there’s an increased demand for YouTube videos download these days. Due to the legality of downloading YouTube videos, some of them have to throw up their hands. But some still ask for a high-quality YouTube video downloadhelper for Android smartphone or tablet. Why You Need a YouTube Videos DownloadHelper? For some YouTube subscribers, they often yearn for the videos they want to collect very much and hope to download the videos from YouTube. It is true that YouTube has provided a platform for visitors to watch various types of videos, such as sports, gaming, TV shows, beauty tutorials and so on. According to BBC News, over 1,000,000 users have visited the channel about making up on YouTube so far in 2018. Among the YouTubers, Yuya, the Mexican beauty expert with over 21 million subscribers, and Zoella are the Top 2 beauty vloggers. There are so many tips and tricks about beauty that the subscribers thirst for an all video downloader to get a complete collection of them. What is more, streaming videos to your Android device is a necessity to kill your time. Imagine this: If you will go somewhere next day where there is neither 3G nor Wi-Fi connection, you may want to download your favorite TV shows or movies in advance in case you quickly get bored with staying on a plane or in a station. Then YouTube videos downloaders are developed to meet the consumers demands. What Is the Best YouTube Videos Downloader for Your Android Devices? There are all kinds of downloaders that support video download from most of the popular video-sharing sites. You may have heard about applications like InsTube, Vidmate, SnapTube, Videoder, etc. Are they the best all video downloaders APK for your Android phone? For most of the Android cellphone users, a free but safe video downloadhelper is the best App they need. More than 42% of the mobile Apps are believed to be malware aiming at those non-jailbroken as well as non-rooted smartphones. Such applications will not only leak personal information of the users but also compromise the users’ privacy. The Apps may be free of charge, meanwhile, they can also be ransomware. To avoid these software, it is suggested that you get free & safe APKs verified by anti-malware software like McAfee or those App download sites visited by many people. Here we’ll take InsTube as an example. InsTube is one of the safe & free Android applications. The downloader offers video downloads form over 100+ video-sharing sites. It has been verified by McAfee, Lockout and CM Security, and has been referred to by many famous Android & iOS Apps sites like Uptodown, CNET.com, AndroidAPKsFree.com, etc. So, if you are looking for a free and safe video downloadhelper to stream all the YouTube or other social media sites videos, InsTube is meant for you. Click here or any of the four links above to get this free & safe YouTube video downloadhelper. Note: Due to Google’s copyrighting policy, almost all the Android APKs about YouTube videos download are not allowed to display on Google Play. If you have any questions on this, please see: Support: Why InsTube is not on Google Play? Read More: InsTube or SnapTube? After the APK installation, tap the icon to launch the downloader. You can easily find the YouTube LOGO on the homepage. Tap it and search the video you like. Navigate it and then tap the “lightning icon(download icon)”. Also, if you’ve had the YouTube URL of the video or the music, just paste it into the search bar. This will help to get the media file faster. 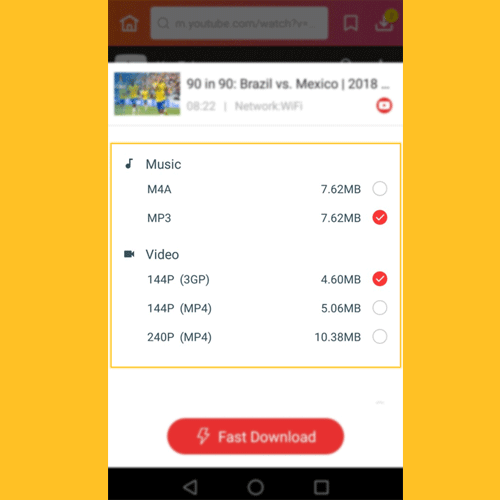 Besides the YouTube videos, the all video downloader also supports downloads from other sites, such as Facebook, Soundcloud, Dailymotion, Vimeo, Vevo and more. You can select the media file formats. The powerful video downloader supports video/audio formats like 3GP, MP4(in different resolutions), M4A, MP3, etc. Note: In the new version of InsTube, it also allows you to convert the YouTube media file format to the one you need. Tap the “Fast Download” button to start the downloading. After that, tap the icon in the top right corner and go to the “My Files” page to check the video/audio you’ve downloaded just now. The newly added files all get a “NEW” table on the top left corner. You can display the media file directly in the App. Also, you can share the video on your Facebook, Twitter, WhatsApp and more. What’s more, the App allows you to extract the video/audio files to your other devices, such as Windows PC, Mac, another Android device and so on. So if there is not enough space on your Android phone, this is the best solution for you to store your precious video files. That’s it. Hope this introduction about the best YouTube video downloadhelper for Android is helpful to you. Get InsTube here and download the videos you are fond of right now! Enjoy yourself this summer.